I thought he was too pretty to be trusted, but current Nashville S.C. President, Chris Jones, ended up being a strong organizing force in the rebirth of soccer in Nashville when I met him in 2013. Nashville had no professional soccer team to pull for at the time, with the dissolution of the Nashville Metros in 2012 after over 20 years in action in the Professional Development League. Fleet Street Pub in downtown Nashville was a cauldron back then. It was the birthplace of a majority of the soccer supporters clubs in the city up to that point. A soccer supporters club is a group of die-hard fans officially affiliated and recognized by their professional soccer club. They can often be found at the crack of dawn ordering pints of Guinness at local American watering holes, all set to watch their favorite teams duke it out before most folks get out of bed. Fleet Street were the first ones to open early consistently for English Premier League matches in our city. Since there is a 6 hour time difference between Nashville and England, soccer here was and still is a morning affair. And while there were many expats watching in smaller numbers in pubs and living rooms around the city, Fleet Street provided a place to organize and bring everyone together. Many times it brought opposing supporters together that despised each other. And while it prompts a heaving chest thinking about it now, the energy and spirit in those matches in which rivals shared the same pub was intense and memorable and beautiful and exhausting. I connected with Chris Jones there, who was on a mission to create a soccer team that was member owned by the fans, modeled off teams like the Green Bay Packers in their ownership structure. They weren't looking for a benefactor, they wanted to own the team themselves. Chris Jones trusted me to help with the initial logo for the amateur team Nashville Football Club that competed in the NPSL or National Premier Soccer League. I was as green as the idea of a supporter-owned team in Nashville, just a couple years out of art school. There was no creative brief. I learned quite a bit during this logo process. I learned that research and collaboration are key. I learned that the supporters drive the club. I learned that logo design and branding are two different things. I learned that stars above your logo mean that you've won a league or cup title. I understood much of the beautiful game, but I didn't fully understand the visual language of soccer identities. Initial Nashville F.C. Logo Sketches and Exploration. Circa 2012. 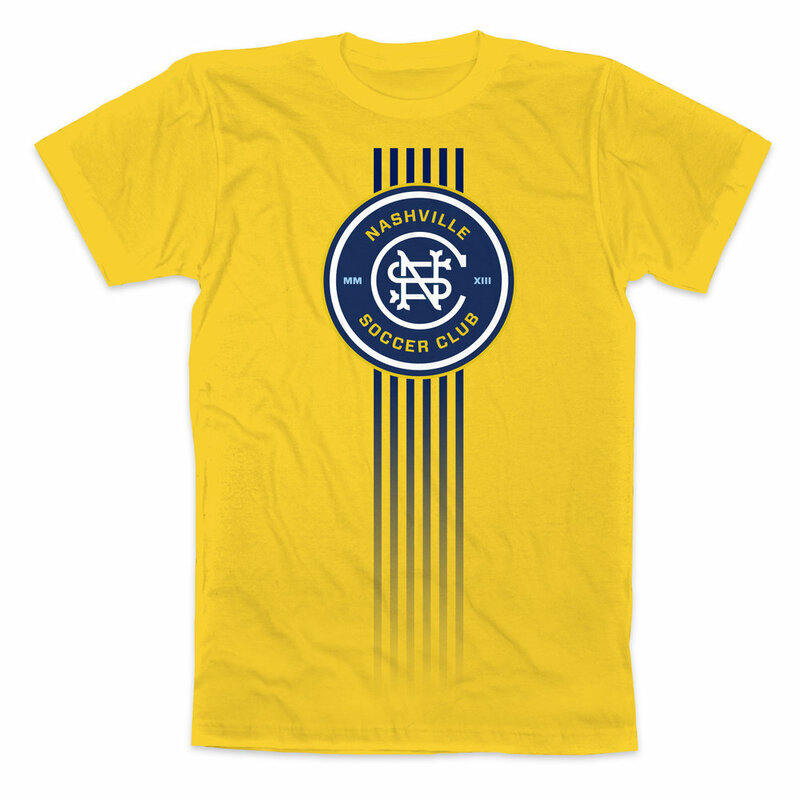 I think the soccer community embraced the Nashville F.C. logo once the stars were removed from the top of the mark. I know the fans caught a lot of flack from rivals for including them, which unbeknownst to me implied there were championships won that were not. That was my idea and something I was embarrassed about for quite a while. You can learn more about how stars are used in soccer crests and logos here. I also learned that even if you have a fleur-de-lis in your city flag, people are still going to give you a hard time if you use it outside of Louisville, St. Louis and New Orleans. Either way I do think the end result was great, and it is something I'm still proud of to this day. The evolution Of Nashville F.C. to Nashville S.C.
Nashville F.C. used their logo marks until 2016. By this point, supporters clubs for most of the more visible English Premier League clubs had organized in town. The soccer scene in Nashville was hot. Friends and enemies were made and rivalries continued, but the embers for the game were slowly turning to flames. Nashville is a town in which people feel they have unlimited potential. People believe that whatever they want to accomplish in this town can be attained. The ownership group and supporters evidently felt the same way. Leadership and organization from David Dill, Chris Redhage and Marcus Whitney created the chance to bring professional soccer back to Nashville with a United Soccer League franchise announcement in 2016. They embraced the culture, the team and Nashville as a thriving city for sport. They took the legitimacy and structure up to the next level. With intellectual property posing a few issues with the USL franchising, the team needed a new name, hence the change from Nashville F.C. to Nashville S.C. Although the name had changed, the ownership group made it a high priority to make sure the name and logo paid homage to the original logo, the initial founders and the fans of Nashville Football Club. Their passion for the game, and their desire to bring the highest level of soccer to Nashville was evident. I was asked to rework and refresh just the mark for the Nashville S.C. franchise by Chris Jones, with whom I'd worked on the original mark. We had both learned a ton during the first iteration, we knew we could improve upon it again. Having learned so much during the Nashville F.C. logo design process 3 years before, I was anxious to get in there and help Nashville S.C. with their updated mark. I explored many different ideas. Here are a few sketches and explorations below. As graphic designers, we often have tight timelines, big demands and loads of pressure. This project was no different. I recruited one of my most talented friends in California to help out due to the time constraints of the project. We explored different options and executions for what made for a very hectic but exciting 5 days. Maintaining the circular shape and typography for the text was a great way to reconnect with the old logo while still giving it room to evolve. There were some options that we were drawn to like this monogram mark on this gold tee, but it felt a little too close to the great work of NYC's Alfalfa Studio for NYCFC with Rafael Esquer at the helm. I've admired his work for a long time, and ultimately this didn't work out to make the cut. I also want to give a shoutout to Zeus Jones in Minneapolis, whose work for Minnesota United is one of the best examples of a full professional soccer brand identity ever created. Bravo. Here are some of the last few marks that were not selected, but they are a good glimpse into the different directions we explored. After multiple rounds of logos and revisions, the ownership group selected what is now the Nashville Soccer Club logo for play in USL in 2018. Honestly this part alone was one of the proudest moments I've had as a soccer fan, yet alone a graphic designer. I remember seeing the flags, t-shirts, jerseys, hats and magnets on cars for the first time. I remember the first time I saw a young kid from the youth league wearing the logo on a shirt. I also remember thinking that some people were not going to like it, or understand it. Although I know I solved the problems posed to me as a designer by the client, I honestly dreaded the day it was released. I was nervous about what strangers on the internet were going to think of the work I created. I've been on the giving end of the unprofessional critique before, and I was sure it was going to come back around. To my surprise, the reception to the mark has been pretty good. I figure if it's been a year and some change since it was released, and no one has sent me any disrespectful emails, it must be serving it's purpose well. Ultimately it was about putting our best foot forward, and setting us up to continue to do ambitious things in Nashville within the sport. Somewhere along the way, John Ingram and company saw an opportunity to take Nashville S.C., which had not even fielded their USL team yet, up to the premier level of play in the United States to Major League Soccer. I was fortunate enough to work with Stones River Group, Clint Brewer and Will Alexander to create a custom hard-bound book that was presented to MLS with the official bid earlier in 2017. We spent a whirlwind of a week putting together a 30+ page piece that displayed exactly why Nashville was made for Major League Soccer. Fast forward to the end of the year. With the help of some heavy hitters in the city, the support of the Nashville Metro Council, Mayor Megan Barry, Governor Bill Haslam, the Ingram ownership group, The MLS2Nashville Committee, The Roadies and the supporters, we pulled off one of the most impressive bids in Major League Soccer history. It's a true testament to the audacity and guile our city continues to embody. Some folks will dig the Nashville S.C. logo, some won't. At this point I'm not really that worried about what people think. I'm human, I'm not perfect, I'm continually trying to become a better designer and I'm proud of the impact the work has had on our bid. I'm excited as hell to finally have an MLS team in Music City. If Nashville S.C. decides they want to rebrand, I hope they'll consider letting me serve them again. In closing I encourage younger creatives to let your interests and passion drive the work you make. Create your work like the whole world is watching, you never know where it may end up. I so appreciate these past opportunities. Thank you. Thank you. Thank you. And bring on Major League Soccer, this is going to be fun.